AMERICAN FREEDOM by BARBARA: Did Ted Cruz's Mother and Father Become Canadian Citizens? Did Ted Cruz's Mother and Father Become Canadian Citizens? Genealogy Expert, Author of "Hey, America, Your Roots Are Showing"; "Who Do You Think You Are?" The unusual Cuba-U.S.-Canada-U.S. migration of Ted Cruz's father, Rafael Bienvenido Cruz. Born in Matanzas, Cuba, Cruz came to the U.S. in 1957 on a student visa and studied mathematics at the University of Texas. In 1959, he wed Julia Garza in a marriage that would produce two daughters before the couple divorced several years later. According tothat same NPR interview, he then married his second wife (Eleanor Darragh, who had a previous marriage to a man named Alan Wilson), and moved to Canada to work in the oil industry. Their son, Rafael Edward "Ted" Cruz was born there on December 22, 1970. Rafael Cruz is quoted as saying, "I worked in Canada for eight years. And while I was in Canada, I became a Canadian citizen." Since multiple sources state that he moved to Texas in 1975, this would suggest that his time in Canada stretched from roughly 1967 to 1975, and this 1974 Calgary voters list offers at least some substantiation. The senior Cruz further asserted that he renounced his Canadian citizenship when he finally became a U.S. citizen in 2005. Asked why he had taken so long -- almost half a century since he had left Cuba and three decades since his return from Canada -- he replied, "I don't know. I guess laziness, or -- I don't know." 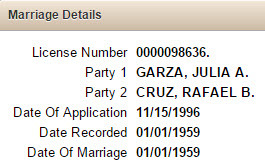 Somewhere along the way, Rafael B. Cruz's parents, Rafael and Emilia Laudelina (Diaz) Cruz, had also come to the U.S., where they eventually passed away in 1991 and 2004, respectively. All of this is interesting, but Ted Cruz's Cuban/then-Canadian/then-American father may well be irrelevant when it comes to his citizenship status. After all, even if born out of the country, you only need one American parent to become an American citizen, so his Delaware-born mother, Eleanor, ticks off this requirement. But immigration law is confusing and constantly evolving, and in Ted Cruz's case, there's both American and Canadian law to consider. And that's where the voters list above raises a question. Was his mother American, Canadian, or both? I don't pretend to be a legal expert, but as far as some Googling permits me to understand (and granted, that's only so far with ample room for correction), it appears that Cruz's parents had to have at least begun the Canadian citizenship process to be on this 1974 list. His father has stated that he became Canadian and since this register is from the last year before the family departed for Texas, he must have been a citizen by then. His mother is also listed, so had she also become Canadian? Even with this question raised, my take is that Ted Cruz probably is a "natural born citizen." The only exception I see would be if his mother had 1) become a Canadian citizen, 2) done so before his birth, and 3) renounced her American citizenship, as opposed to becoming a dual national. And I assume that this narrow set of criteria does not apply since the Cruz family was able to move back to America and Ted Cruz was later permitted to renounce his Canadian citizenship. That he was able to do so indicates that he was indeed a dual national. Otherwise, dropping his Canadian citizenship would have effectively rendered him stateless. Still, given the ever-increasing mobility and interaction of people of all nationalities, the odds of even more perplexing scenarios will only multiply in the future, so wouldn't it be a good idea to clarify once and for all the meaning of "natural born citizen"? Labels: Did Ted Cruz's Mother and Father Become Canadian Citizens?